shaman-art and marija: Very useful information! In the northeast part of the US people have been talking about Whitey Bulger for years and years, and I truly wondered if another take on Whitey was the best idea. But it seems that my own perspective was too local. So many folks in the US haven't followed his career at all. And then, of course, there's the rest of the world -- which is ever more important to the distribution of American films. Thank you for your insights girls! fireflydances wrote: And then, of course, there's the rest of the world -- which is ever more important to the distribution of American films. Thank you for your insights girls! I really hope that the topic is interesting enough for people outside the US. I would have read the book anyway even without any Johnny connetion because I really like crime stories - fiction and nonfiction. But without Johnny most likely I would have never known that this book exists. And I have to thank you and Liz for finding all the tidbits and the good questions. Cyn wrote: Like a few others here, I, too, had never heard of the man until the rumors and blurbs started here on the Zone about Johnny possibly playing him in a movie. I’ve never seen anything about him online or in the news in my entire life, and I know others here in this area (southwestern Ohio) have never heard of him either, which is why it surprised me when this ONBC discussion first began and someone used the word “transfixed”, if I remember correctly, to describe the state that people are in about Bulger. Like someone else mentioned here in this thread, it seems that he was only a local criminal celebrity, in the northeastern part of the country. Having said all of that, I wish I had read the book, since I’ve always been a true-crime aficionado, and it actually began in my teens when my dad gave me 2 letters that Dillinger had written in jail in Indiana. It fascinated me to no end to own them and hold them in my hands and picture Dillinger writing them in his jail cell, and it inspired me to start reading all the books that I could find on him, and then I branched out to read books about other famous criminals of his day, and then onto more current and recent criminals, so this book would have been right up my alley. But I don’t have the time that I used to have, to be able to sit down and read book after book. Like others here, even though I didn’t read any of the books associated with Bulger, I followed all the tidbits and posts from day one, and found them very interesting. The Italian Mafia has always fascinated me to no end, so the Irish equivalent would be interesting to read about, I’m sure. As for the way that Johnny will play Bulger, I just want to say that I hope he doesn’t soften him up or make him (too) likeable, since he wasn’t/isn’t that way in real life, apparently, from all that I’ve read about him so far. Judging just by the expressions on Johnny’s face in some of the pics taken of the outside filming back in the summer, it doesn’t look like he’ll be portraying him sympathetically in the least, at least not when he’s killing someone or ordering someone to be killed, which is good. He shouldn’t try to whitewash a true-life character who was inherently bad with little to no morals, IMO. He played Dillinger as a likeable, congenial guy with a heart because that’s how Dillinger actually was, so he did a fantastic, believable job of blending all the elements—good and bad—of Dillinger’s persona. That's pretty cool, Cyn. Thanks for sharing. My dad was born and raised in Dayton, Ohio--as was I--and he later worked for the detective agency owned by the man who had planned and carried out the surprise bust of Dillinger and Mary Longnaker in the early 30s in a boarding house on West First St. in downtown Dayton. The relationship with Mary ended after that bust and she married someone else, then came Evelyn 'Billie' Frechette (played by Marion Cotillard in PE), and then Polly Hamilton who was with him when he was killed at the Biograph Theatre. 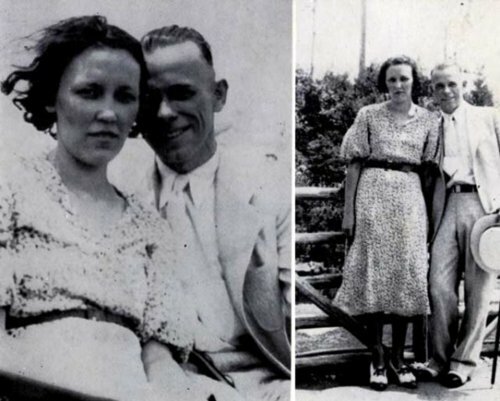 Mary’s name wasn’t even mentioned in PE, but she was one of the most important people in Dillinger’s relatively short life, since she had left her husband for him and they were engaged to be married. From what I could tell by the movie, they seemed to have combined the 2 women--Longnaker and Frechette--into the one character of Billie, because the hotel room bust of JD and Billie in the movie PE was exactly how the Dayton boarding house bust had happened. Most of the books I've read about him describes the Dayton bust in some detail. Anyway, it was such a thrill for me when the news first came out that Johnny would be playing Dillinger, and then especially later on when I saw PE for the first time, when the wanted poster with the pic of Johnny made up to look like Dillinger and the words ‘Dayton, Ohio’ in big letters appeared onscreen. Wow. Very, very cool! What a neat thing to have passed down from the agency owner, to your dad, to you. Thanks for sharing! Your posts got me thinking - what a stark contrast there is between Dillinger and Bulger. Both men operating on the wrong side of the law, but gosh, how completely different they seem to be personality-wise. Liz and Firefly - thanks again for all your hard work, and another wonderful discussion!!! It was educational and thought-provoking - as always!! RamblinRebel wrote: Liz and Firefly - thanks again for all your hard work, and another wonderful discussion!!! It was educational and thought-provoking - as always!! Absolutely! This was a difficult book for many of us, and our fearless leaders did an excellent job! I'm looking forward to a much more entertaining and light read next time. nebraska wrote: This may be a strange question, but I wonder how many here enjoyed the book and found the subject matter interesting. Why or why not? And are you looking forward to seeing the movie? Hi nebraska! I am getting in on the last question after missing 90% of this discussion. Anyhoo, I found the book interesting and wanted to know what happened to those portrayed in it, but also that these were/are real people. That made it more interesting to me. I am looking forward to seeing Johnny's portrayal of Whitey now that I've read about the man. It'll be interesting to see if his "Whitey" is a likeable fellow or one that I'll despise, like the real Bulger. So another great discussion comes to an end. This is always bittersweet...I've enjoyed the discussion and tidbits, as usual. No matter the subject matter of the book, I find it fascinating to see everyone's reaction to it. And I love the banter, wish I could have participated more. But I'm so looking forward to the next book...another topic, another set of tidbits, another great discussion in the works! Thanks so much ladies for all you do for ONBC! I am still working my way through the All Souls book by Michael Patrick MacDonald that firefly recommended earlier in this discussion. It is an interesting story by someone who grew up in poverty in Southie, and I am surprised by how often he mentions Whitey Bulger. It gives another perspective to the Bulger story. If anyone is interested in pursuing more about Southie and Whitey, this really is an excellent book for learning about it. When it comes to movies based on real people, it's tough to decide what book is best to read. Thus why so many of us read additional books about Simone de Beauvoir and Nelson Algren. But we don't always have the time to read all the books we would like about a particular person or event. So the obvious choice is to choose the book that inspired the movie, and go from there, adding what we can, from the research we've done, as tidbits, or as input to the discussion. Liz wrote: When it comes to movies based on real people, it's tough to decide what book is best to read. Thus why so many of us read additional books about Simone de Beauvoir and Nelson Algren. But we don't always have the time to read all the books we would like about a particular person or event. So the obvious choice is to choose the book that inspired the movie, and go from there, adding what we can, from the research we've done, as tidbits, or as input to the discussion. Good point, Liz! I wish I had time to read all the books I want to, but like most here I have a towering stack (and a full Kindle). The book we read is the one that inspired the movie Johnny will be in and this IS, after all, a Depp Zone book club. I enjoyed reading this book. It's not anything I'd have ever picked to read on my own--like most of the books we read on the ONBC--but like most of those books, I did enjoy this one too. I liked how the story focused on the relationship between the FBI and Bulger. Of course, the tidbits we got here just rounded out the background of the story...made it more 'complete' to me. Theresa wrote: I enjoyed reading this book.It's not anything I'd have ever picked to read on my own--like most of the books we read on the ONBC--but like most of those books, I did enjoy this one too. I liked how the story focused on the relationship between the FBI and Bulger. It has certainly rounded out my education, for sure. And I count several of the books here at ONBC among the very best I have ever read! So kudos to the moderators for their choices, as well!